Facilities management teams know the devil is in the details—which is why they can track them with our template. In the big picture, you’re responsible for managing a secure location, budget, and lease. But in the day to day, tons of new questions and requests come in making demands on your time. Its can be hard to keep track of every facility need that comes your way, but deadlines are critical to meet. Instead, facilities teams can rely on our request template to organize new questions, and gather the important details to be able to respond efficiently—whether it’s the about the budget, lease terms, or wall measurements. Make questions clearer. Via email, people don’t always provide the right details. Our form gathers the information you need from employees to answer their question or fulfill their request. Track requests in one place. If questions and needs are coming at you in person, via email, and from contractors, that makes it easier to lose track. Instead you can tackle your to-dos with one list. Leave time for priority work. If you constantly get distracted by the day-to-day demands, that makes it hard to focus on bigger priorities. Our template helps you prioritize what you can tackle in a given time. Days derailed by quick questions? Introduce a more productive way to file and track requests. Cut the chaos that kills productivity by learning how to prioritize incoming facilities requests. Follow along with our quick tutorial so no requests get lost, but your team doesn't get bombarded. 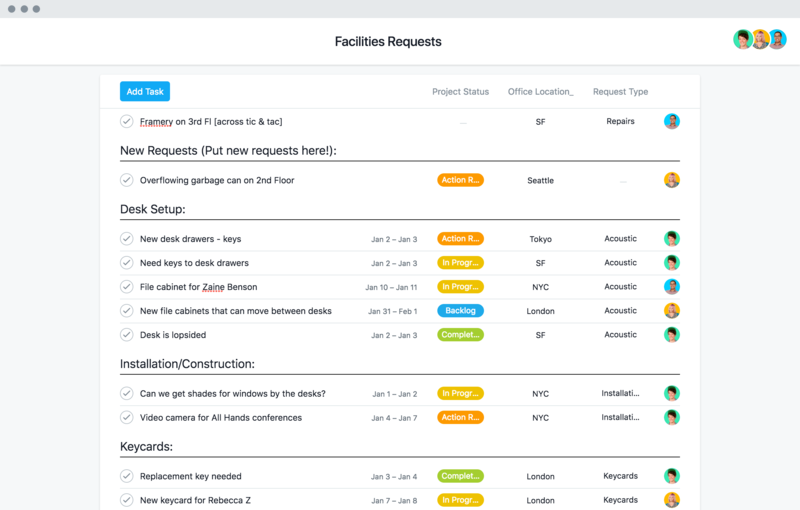 Facilities teams trust Asana Premium to track and manage requests to help employees love where they work.